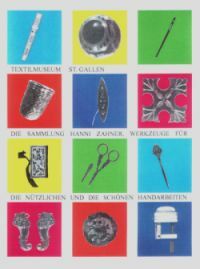 In early 1993, the St.Gallen Textile Museum was given a variety of needlework utensils, which had been collected with a great deal of love and expert knowledge. The utensils from the late 18th, the 19th and the early 20th centuries constitute a wealth of cultural heritage and provide the key to women's domestic activities. There is a rich diversity of such utensils, graced with valuable ornamentation, often designed as a souvenir rather than intended for intensive use. Some of these textile utensils are inconceivable without the emerging fondness for travel by post coach and railway between 1800 and 1900. In the exhibition, the needlework utensils are allocated to the textile techniques of which they are typical. This is not all, however: the exhibition reveals how the upbringing of 19th c. girls was strongly oriented towards training in domestic matters. A woman's role was clearly defined: she was the head of the internal household. She had to be able to master all the textile techniques. In addition, she had to be a good wife to her husband and a good mother to her children. Up to the early 20th century, women were hardly ever expected to have professional careers. A clear distinction was made between useful and beautiful needlework. The useful techniques included knitting, which is the basis of all textile activities, as well as crocheting, darning and sewing. Embroidering was regarded as a particularly nobel activity. Working with a fine needle, with colours and precious materials was considered to be decidedly feminine. The production of objects that were beautiful to behold and a joy to contemplate was believed to be particularly conducive to the developemnt of the noble female soul. In elevatged bourgveois circles, both embroidery and music were among the daily activities. The necessary useful needlework was done by maids and servants, who were paid wages for it. For centuries, nuns in convents produced the finest kinds of embroidery, with the greatest devotion and patience, in a position of concentration and meditation. In Eastern Switzerland, embroidering became a major source of gainful employment in the 18th century and, particularly, in the 19th century.